2. I love cats even more when they kindly avoid hunting my feet or dropping dead bugs on my front porch. 3. Zombies scare the heck out of me - yet I still like to read about them. Go figure. 4. I don't like cleaning fishtanks. They smell. They're slimy. And they smell. Oh, I said that. 5. I've been writing seriously since I was 13. My first novel was nearly a thousand pages long, written by hand in a stack of notebooks. Needless to say, I converted to typing soon afterwards. 6. I've been attacked by a Beagle. 7. I can play the piano. But I can't read music, so I'm no Mozart. There you have it! 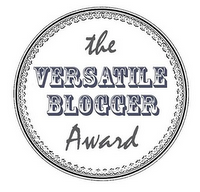 And here are my fifteen nominees for the Most Versatile Blogger Award. Thank you so much!!! I love your blog - the black and red is gorgeous!!! Oh, and did I see that you're a TVD fan also?? Squeee! Thank you so much for the nomination! :) I nominated you right back! Now I'm wondering how the Beagle attack panned out...;) Keep up the good work! Thank you so much for the award. I will try to follow up this week. Thanks for nominating me! Ive been away so havent been able to do mine, but I will do it this week :D Do you know when it ends? I reposted this award on my blog. Thanks again, lady!